A pair of programs have been launched to steer city students away from drugs and towards careers. 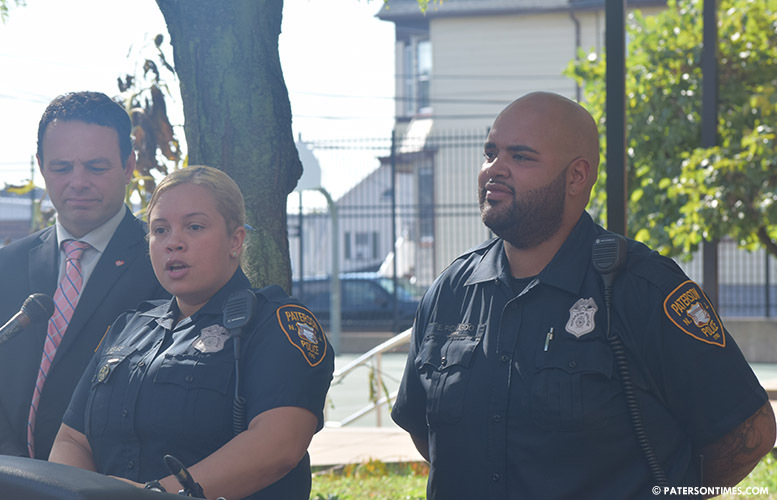 School officials unveiled both programs — the Law Enforcement Against Drugs (LEAD), aimed at teaching K-12 students to steer clear of drugs, cyber bullying, and violence, and the Paterson Police Explorer program, targeted at high school students to push them towards careers in law enforcement and other fields — at a press conference at the New Roberto Clemente Elementary School on Wednesday morning. Shafer said the LEAD program will give young people the needed tools to steer clear of using, dealing, and abusing drugs. Police officer Irsi Velez said the program has ten lessons and will run for the entire school year. She said half of them are focused on life skills and the others on substance abuse. “If they are given these tools at least they will make better decisions,” said Velez (pictured, left). Five schools – the New Roberto Clemente School, School 12, Roberto Clemente School, Urban Leadership Academy, and the Great Falls Academy — have been picked to pilot the LEAD program. School officials are in the process of picking high schools for the explorer program. Velez said the explorer program will encourage youngsters to consider careers in law enforcement. She said it will help high school students to build their resume and apply for college. She recognized not every student will be interested in a career in law enforcement. Velez and police officer Eddy Pichardo, who have received training through the Law Enforcement Against Drugs (LEAD) organization, will run the programs. Both will instruct youngsters in the classrooms. Police chief Troy Oswald said both officers took the initiative and paid for their own training to bring the LEAD program to the city. Velez was born and raised in Paterson. She no longer lives in the city, but has family members, who call the Silk City home. Pichardo (pictured, right) lives in the city and is a candidate for school board in the November elections. Velez said both programs will start in the first week of November. She said several hundred students will be part of the LEAD program. She hopes to recruit 80 students, 20 per phase for four phases, for the explorer program. The 5th Ward councilman is not related to the police officer. 130 students tested positive for having drugs in their system last school year. Over the past two years, the district saw slight declines in students tested positive for drugs due to Shafer’s hiring of more substance abuse counselors. “I’ve advocated for these programs for years on the school board,” said councilwoman Lilisa Mimms, who is the chairwoman of the education committee. She served on the school board prior to winning a seat on the council. Mimms did not know about the press conference at the New Roberto Clemente School. She said the programs will also build relationships between police and the community. Velez said the program won’t cost the district anything. She said the Mendez Foundation (not associated with ex-councilman Alex Mendez) will supply workbooks for 600 students. Municipal Coalition will provide pens, notebooks, and other materials.